These popular soft corals are often kept by beginning reefers both because of their beauty and because they are among the easiest corals to keep in a saltwater aquarium. Here are photos of a collection of Family Alcyoniidae - Genera Alcyonium, Cladiella, Lobophytum, Sarcophyton, and Sinularia corals. These are species commonly named Colt - Devil's Hand - Toadstool - and Finger, Encrusting, Lobed, Knobby, Flexible, Flat, Trough, Cabbage, Mushroom Leather Corals. The Fire Clownfish in this photo refused to host any Anemone that we put in our 92g reef tank, but she sure loved this Toadstool Coral and would defend it to the death. The Toadstool would skin over, then shed every 2 months or so and it would drive the Fire Clownfish crazy when she couldn't nestle in the Toadstool's tentacles. 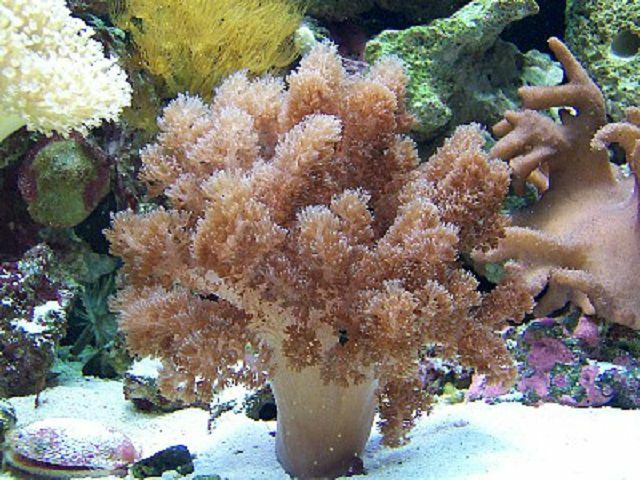 Another common name for this coral is Finger Leather Coral. It is the Family Alcyoniidae and the Genus Cladiella sp. Finger Leather and Colt Corals are hardy and adaptable to most conditions of light levels and water movement. Most Finger Leather and Colt Corals are found at mid-water levels in the ocean, so moderate light and current levels are optimal for them in captivity. These corals are safe with fish, crustaceans and motile invertebrates. Using a highly-developed mucus capture and transport system, these corals derive nutrients by collecting and ingesting particulate matter suspended in the water around them, and from their zooxanthellae. Colt and Leather Corals are considered to be Good Beginner Corals due to their forgiving nature. Family: Alcyoniidae | Genus: Possible Alcyonium sp. Other Common Names: Toadstool Coral, Mushroom Leather Coral, Trough Coral. Family: Alcyoniidae | Genus: Sarcophyton sp. Sarcophyton corals tolerate a wide variety of lighting levels and are very adaptive to aquarium life. They tolerate most water currents, but do not prefer strong water movement. Sarcophytons shed a surface layer of dead waxy tissue, a method of removing accumulated waste, debris and algae. Sarcophyton corals tolerate a wide variety of lighting levels and are very adaptive to aquarium life. They tolerate most water currents, but do not prefer strong water movement. Sarcophytons shed a surface layer of dead waxy tissue, a method of removing waste and accumulated waste, debris and algae. Once a Sarcophyton coral has shed what could be described as a layer of "old skin", it's not unusual for it to appear larger and more magnificent than before. Sarcophyton corals tolerate a wide variety of lighting levels and are very adaptive to aquarium life. They tolerate most water currents, but do not prefer strong water movement. Common names include: Cabbage Leather Coral, Finger Leather Coral, Knobby Leather Coral, Flexible Leather Coral and Flat Leather Coral. Sinularia Corals are tolerant of different light and current levels, but prefer bright light and moderate to high current. Some species are extremely toxic and can poison hard corals in an aquarium. Some species contain a strong neurotoxin which can affect humans. Finger Leather and Colt Corals are hardy and adaptable to most conditions of light levels and water movement. Most Finger Leather and Colt Corals are found at mid-water levels in the ocean, so moderate light and current levels are optimal for them in captivity. These corals are safe with fish, crustaceans and motile invertebrates. What Do I Feed My Corals? Quiz: Who Wants to be a Marine Biologist?